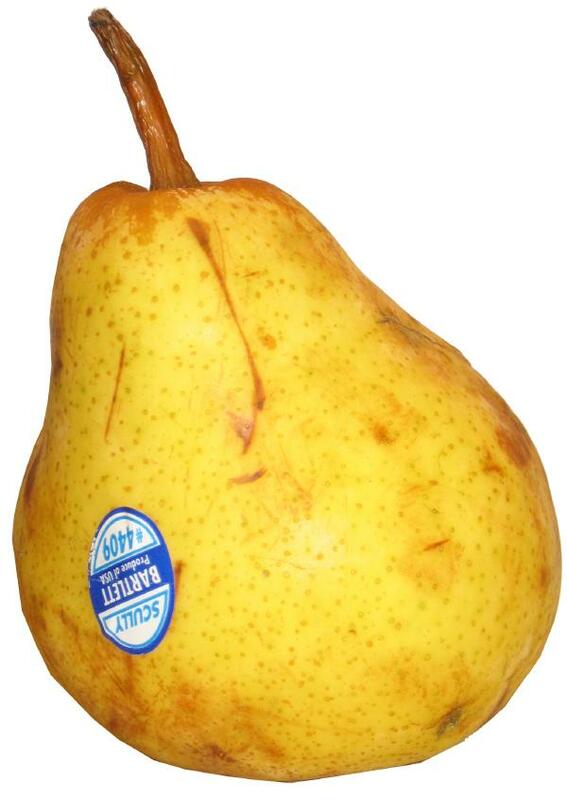 The best-tasting Bartlett pears are the ones that are a little dinged up and smell as strong as perfume. Their aroma, more than the taste or texture, have always reminded me of something, but I couldn’t remember what it was. It was a good memory, of good times, but I couldn’t place it. So, whenever I’d come across a ripe dinged-up Bartlett in the grocery store I’d inhale deeply, smile idiotically, and wonder why I felt happy. This has gone on for decades. No kidding. I just chalked it up to part of my personal quirkiness and let it go at that. Hey, you get your jollies when you can. I feel rather the same way about bean soup. Navy, not black bean, and only home made. I’m happy to just breathe it in, just can’t figure out why. A recent bowl of bean soup brought back that familiar wisp of recognition, a remnant of the past that was on the tip of my tongue. Literally. But I couldn’t retrieve its meaning. I remembered that as a kid I didn’t like beans soup, and then it hit me! The smell of the bean soup and the smell of ripe Bartlett pears collided and I remembered why I felt such an emotional connection to them. The time and place had eluded me all these years, and then there it was in a flash: Italy 1962. That’s where those aromas transported me. Instantly. I was a second grader again at the Parioli International Day School on Via Nomentana in Rome. My teacher, the beloved Mrs. Pensa, sat at the head of our long wooden table. The lunchroom was downstairs in the basement of the palazzo with high vaulted ceilings and thick stone walls. The whole school ate together each grade at their own table. The cooks, in white aprons, brought out Pasta e Fagoili (bean soup with macaroni) in heavy white bowls. The smell of the hot soup filled the entire room. It always smelled delicious. I remember thinking ‘how could something smell so good feel so bad in your mouth?’ It was a textural thing. And I remember just being near Mrs. Pensa was so wonderful because I was a goody-two-shoes and I adored her. I didn’t want her to like me less for eating the pasta and leaving the beans behind. And she still liked me. And I was relieved when the pears came for dessert because I liked those and I would enjoy every bite even though the juice dripped down my chin. I don’t remember anything else we ate, or any other memory in the lunchroom for that matter. And you’re going, “this is why people shouldn’t have blogs.” Yeah, you’re probably right. But wasn’t that a nice photo of a pear? Oh, and one of my classmates at the Parioli International Day School was Chistopher Wilding, son of Elizabeth Taylor. She and Richard Burton were living in Rome while they filmed Cleopatra. And yes, I went to Christopher’s birthday party. But that seems boring in comparison to the memory of the pears and the bean soup, doesn’t it? I have never been to Rome, and really never liked bean soup, but your memorie was wonderful and I have the same feeling with home baked chocolate chip cookies and slow roasted beef. “..why people shouldn’t have blogs.” ?? People write famous classic novels about memories like this. Not that I’ve read that one, but I enjoyed reading this one! Why aren’t you a stand-up comic????? You have been making me laugh for years with your off-the-wall comments on just about everything you write!!!! Ami, I just love this blog!! I’m transported by smells to the past as well. One of my strongest is the smell of mint. Growing up, we used to play close to a river in east Africa, where mint grew wild. I remember picking it and enjoying the flavor and odor. Years later I smelled fresh mint, and immediately was transported back to that riverside, enjoying a cool Saturday morning. I hope I never lose that, because you can do that if you smell it too frequently. Memories like that are special–treasure them!!! That was a fun blog! I do that! Interesting how food is often involved in memory and smells. Smelling COW takes me instantly back to childhood. Others go YUCK and I’m in the barn with dad and kittens and etc. I just returned from a trip to Italy, spent 3 glorious days in Rome. I know what you mean about the wonderful food smells! The pears, and tomatoes, and all produce actually taste as they are supposed to taste! How lucky you are, to have lived abroad. We also did, for a couple years (in Germany), and are lives are enriched for having done so. Oh, the smell of navy bean soup! That brings back good memories. When I was a child, my grandfather would spend weeks at a time at our house. He loved navy bean soup, and apparently my grandmother would not make it for him, so my mom did. So warm memories of my beloved grandfather go hand in hand with navy bean soup! Thanks for bringing back a nice memory (smiling the entire time I’m writing this)! I just love how fragrances can transport you to the past! Thank you for sharing that memory. I bet you were a very cute kid! Not such a strange connection. I love pears. Not just about the way they taste and smell. I love the way they look. I love the shape and I love the color. Show me a piece of fabric with pears on it and I will buy it. I have pear stuff everywhere. Go figure. That reminds me I need to go down to the meadow and finish picking all the pears. As for beans…yup, navy beans and bacon soup is one of my all time favorite dishes…slow cooked it scents up the kitchen in a homey, cosy way. Olfactory memory is the most potent memory trigger we have. More than visual or aural stimulus. Long before we can associate word sense to memories we register and store scents. Decades later memories can be triggered simply by scent recognition no matter how out of context that stimulus is. Life is a wonderful mystery is it not. What a wonderful story Ami. Isn’t it fun to have those memories pop when we least expect them? Thanks for sharing.! So when you see the pears at the store, do you buy them?? And have you had bean soup lately? I love bean soup! I think you should try some and see if you feel the same about it. All of this can be accomplished in your multitudinous spare time. :-D Keep us posted on the progress. And this IS why people have blogs. I loved it. Food is a great memory. The best apple I ever ate was a nice crispy cold one from an outdoor market in Germany. Instant oatmeal reminds me of camping trips when I was a kid. I have a terrific recepy for real “Pasta e fagioli”: I know you don’t like to cook but, should you be interested, just let me know! I just loved your story: eating that wonderful food under those antique vaulted ceilings must have been like living in a dream! Its amazing how strong smells bring back memories. For me its the smell of oatmeal cookies and any hot dish (casseroles) that say home at Grandma’s house. So tell us more about Liz! Surely she came to parents night…lol. Yes! I understand those sorts of memories. It’s great to have them come back at you and revel in that wonderful warm feeling. Just keep enjoying, and try not to feel too sorry for those poor folks who don’t get these trips to bliss. I enjoy your blog, even if it is not quilt related. This is why people HAVE blogs! I love this story. The pear photo evoked many fond memories and scents. Great pic! Ami, I loved this blog because it made me think about my favorite smells from long ago. Almost 50 years ago, I asked my sister-in-law what smelled so good in her house. It was the roast she was baking with garlic sprinkled on top. My mom made wonderful dinners, but she didn’t use garlic. Now I love that my house often smells that way, too! I was googling Parioli International Day School just for the hell of it and without much hope as a previous attempt had not netted anything. So I was very pleased to drop in on your past blog entry featuring your memories of the school. I left PIDS in 1960 when I was in (I think) the seventh or eighth form as I entered the seventh grade junior high school in an American school in Tokyo where my father was posted after Rome. I too have very fond memories of the cafeteria food served by our teacher at the head of the table. I grew to love minestrone soup and salads during a childhood in which I had forsworn the eating of vegetables. To this day I have only once come across the same delicious taste of that soup which immediately enveloped me in the memory of that canteen. Indeed I have many fond memories of that school which sadly I heard some years after I had left that it had moved to Milan. Thank you for bringing back those memories. I went to Parioli International Day School also 1960-1963 (not positive of my last year)! So wonderful to read your blog Ami! Have only come across one other person in the 70’s from those school days in Rome , her name “Daria” but have since lost touch. Do you remember the Romulus and Remus patches on our uniforms? Wow, I too came across this by googling Parioli Day – only because I grew up in Rome (Overseas School, St. Stephen’s, American College of Rome) and had never heard of it, but came across it today and was curious…..
Love the pasta e fagioli memory, I have the same one of the ladies at the OSR lunchroom and the big steaming white bowls and me eating around the beans….I love that I wasn’t the only one, even if you were all the way across town! What a very very small world! Wow! I went to PDS for the school years ’59/’60 and ’60/’61. Michael Wilding was my boyfriend in 4th grade. The entire 4th grade went to his birthday party at his villa on the Appia. The girls were serenaded by Eddie Fisher. It is a small world! Hi, Joan. I remember you, Michael, Chris, Jeff Lydon, Lisa Sinclair, and many others well. Also, Hi to Patricia Corbett who signed in below. What a laugh I had reading about the tuna and pasta casserole. Boy, that dish was hard to swallow. I remember that Mrs. Pensa told us how she narrowly escaped drowning in the port of (Haifa?) as a young woman. The tub of a ship she and the other refugees were on sank as they were waiting to be accepted into the newly created state of Israel. Luckily, a young man, who also went down with the ship but could swim, had his eye on her and came to the rescue. She flailed so much during his rescue that he had to knock her out so he could drag her in. Good thing she was quite a looker in her younger days. Wow! How this brings back memories of the eating area at the Parioli International day school. Unlike others I have had a bad memory of being forced to eat spaghetti with TUNA. The smell of cooked tuna even today makes me sick when I think of the teachers forcing me to eat it. How I can picture that room with the long tables under the school. I left in 1957 after attending one year at the school. My best friend I think was Garth Welsh and the form mistress was Elsa Anderson with the Headmaster Paul Burke -Mahony. Philip, thanks for sharing your memories about the school. I don’t remember the spaghetti with tuna; perhaps they did away with it before I got there. Same headmaster. Remember the chair he sat in? He scared me to death. I too particularly remember the tuna spaghetti, a horrible invention (I attended the Parioli site from 1955 or 1956, before the school moved to the Nomentana). And the bad-tasting, beige milk called Latte Stella. I also remember Mr B-M, and Mr Gibson, who went on to run a school in Florence. And many lovely teachers, like Mrs Pensa, the delightful Mrs Trujillo de Medina, Miss Snowball, Gilly Rogers, Mrs Bacchilega (science), Mrs Volpicelli, and an Irish teacher whose name I forget but who taught hygiene… I won’t mention the gym teacher however. I don’t remember tuna spaghetti. Perhaps they did away with that gastronomic delight before I got there in the 60’s. I too had the gastronomic “pleasure” of dining there. I was a student from the Summer of 1963 ”til Spring ’64. My keenest memory of the cafeteria was having a salad that had small live snails in it. I don’t believe their inclusion was intentional. I was in either the fourth or fifth grade. Other personnel I recall are the teachers Mrs. Priebe, and my teacher, Miss Konstantinoff, and I think a Miss Nicosia was the nurse. I had a classmate named Betsy Brantley, whom I had a great crush on. She might be the actress by that name… I really don’t know. She had a sister there named Becky. Other classmates in Miss Konstantinoff’s were Charles, Shinichi, Daniella, Barclay, Terence and Jacob; sorry that I don’t recall any last names. I can still picture the property, building and my classroom. I must have borrowed every book in their library. I returned to the States in about April 1964. Within the year I saw two films that featured parts of Rome I easily recalled: The Pink Panther and The Last Man On Earth. Thanks for providing this blog for us to reply to. i8 was a student in this school 1961-62 my name is shlomo peri and i am from israel i was in the same class with zaidun jawdat do you remember our names? i had a girlfriend daria fordyce she was a pretty blond i wish i could find her! I didn’t know Daria, but she has to be related to Addison Fordyce, who was in my class either at Parioli Day or later at Notre Dame International. It’s not a name that you run into every day, so maybe this will help you find her. John, it was good to talk to you. I just found this today! I was also at Parioli, probably in 1962 – 64? Miss Kopke, I think, was my teacher. A year ahead of Carmine? I remember Mr. Gibson taking us to the Roman Forum and telling tales of what happened here and there, but where I cannot tell. Shinichi past away last September just before going to Beijing as the Ambassador from Japan. More shared Parioli memories from the Sixties! I have often wondered where my distant childhood friends are now. Does anyone know the whereabouts of Michiko and Miyoko Watanabe, Ofra Perry, Habira Habir? I hope this reaches you. I posted before and came back to find a name I recognized, yours and my sister’s! Habira is my sister and I knew you as her good friend. She lives in Jakarta now and would be happy to hear from you. About the Watanabes, I did know they attended the Sacred Heart in Tokyo in the late ’60’s and married in the early ’70’s to diplomats? Sorry for a very vague memory going back some forty years. And, Jon, how is Karen? She definitely was in my class. No, sorry, I don’t remember the name. It would be great if you could send my email address to Patricia Corbett who posted above and asked about the whereabouts of, among others, my sister, Habira Habir. Habira would love to get in touch again, if possible. Thank you again for this continuing series of opportunities to reminisce about the memories of what was to me a memorable school during my time there – 1958 to 1960. I still have a class photo that was taken in front of the Nomentana school and can recall most of the names of what admittedly was a small class, Mickey Gazith from Israel, Frank Worth, Arnold Paradise, James Franey, Ned Smythe, Greg Nickel, James Rispoli, Marco (last name escapes me) from Venezuela, Jackie Lorimer, Rhodora Resnick, Teresa Brewer, Jennifer from Canada and two other girls whose names I have forgotten. Mr. Valencia, our teacher, is in the back. Hiroshi Narasaki, who introduced me to baseball, had left for Japan earlier. Thank you, Ami, for sending my email to Patricia. She has responded and my sister, Habira, will be getting in touch with her. Very much appreciated. Such a small world we live in! That was John Paul Getty, Jr. and Mr. Hickey.